Forget everything you know about Tijuana — the all night clubs, cheap margaritas, junk taxis, “gringo” tourists and Chicklets. You won’t find any of that where you’re going. Tijuana is still “the border,” but it is also Mexico’s fastest growing city. With an unofficial population pushing 2 million people and 60 million crossing the border each year, Tijuana is redefining itself with a new artistic and culinary movement. There are a multitude of reasons to visit Tijuana. The heart of this modern change is just a few blocks from the border in Zona Río, the financial and culture center of Tijuana. As you exit the highway onto the tree-lined, six-lane wide boulevard Paseo de Los Héroes and navigate the gigantic traffic circles (glorietas) at each intersection, you’ll find yourself marveling at the towering statues of famous leaders from Aztec Emperor Cuauhtémoc to US President Abraham Lincoln (yes, that Abraham Lincoln). But keep your eyes on the road — negotiating the traffic in the glorietas is not for the faint of heart. Later, when you walk the street on the foot, you’ll find yourself stopping to gaze up at these statues in awe. If you’re hungry, the perfect start to your day in Tijuana is an authentic breakfast at La Fogata. A popular Mexican Steakhouse and discotheque in the evenings, La Fogata serves traditional Mexican breakfast: eggs in a variety of delicious styles — huevos rancheros, huevos divorciados (one in red sauce, one in green) and omelets, pan casero (homemade bread), nopal cactus and, of course, plenty of meat. Their machaca, shredded beef mixed with scrambles eggs and green peppers, is a delicious south of the border hash. While crime still exists in Tijuana, walking the streets is as safe as any North American City — especially during the day. You will want to leave your car in a parking lot and set out on foot to explore the sights. 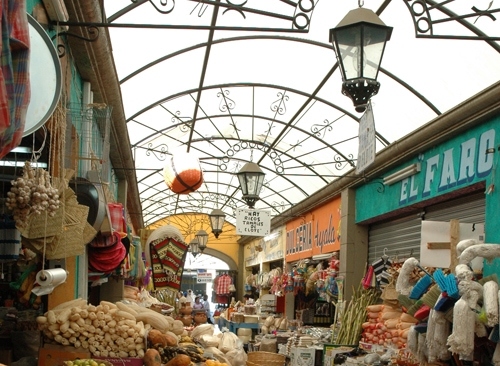 For an introduction to the tastes of everyday Mexico, a short walk two blocks west of La Fogata you’ll find Mercado Hidalgo, a brightly painted, two-story orange and yellow market the size of an entire block. Morning is the best time to visit this bustling indoor-outdoor farmer’s market. As you walk among the crowds of local Tijuanenses, the friendly vendors display everything from fresh flowers and produce to a spectacular array of dried beans. The sights and smells are captivating. Brightly colored fruits with strange, wiry hairs look like they’ve arrived from another planet. Yams, pumpkin, fruits, nuts as wells as other unexpected, freshly candied food items will tempt you with their sugary coatings. And don’t forget cajeta (caramel), queso (cheese) and chiles, all sold by the kilo. If you speak even a little Spanish and you’re curious, ask the vendors what they are selling. Many of them have family living in Los Angeles, San Diego and Chula Vista. More often than not, they speak English. They’re happy to explain what these odd looking items are and how to prepare and serve them. They’ll even let you have a taste to feed your curiosity. If you skipped La Fogata or the smell of meat searing on a grill whets your appetite, sample the tacos and carne asada from any of the tiny, packed family restaurants. The tortillas are all hand-made and the meat is fresh. If you’re in the mood for authentic souvenirs, you can also find inexpensive kitchen utensils, hand-crafted figurines and dazzling array of well-made piñatas. After exciting your senses with aromas, colors and textures, head east on any side street back to the Centro Cultural Tijuana (CECUT). On the corner of Paseo de Héroes and Av. Independencía, you can’t miss this unique and compelling complex. Its signature structure is a gigantic, adobe-colored planetarium-looking dome that houses an IMAX Theater. The presentations change seasonally, with daily screenings of two 45-minute films in Spanish and an English-language film at 2 pm on Saturdays and Sundays. Wander around the lobby and marvel at the ultra-modern architecture and design. Watch a film, even if just for the visuals. Or continue onward to the museum’s main building. Inside is a gallery for visiting modern exhibits, a permanent collection of Mexican artifacts tracing the discovery and development of Baja California from Pre-Hispanic times through the contemporary political era, and an exhibit of indigenous and contemporary art collected over 25 years of the CECUT’s existence. There’s also a theater, shows for children and lectures, music, theater and dance performances held in the center’s concert hall and courtyard. Browse the bookshop, then take a quiet stroll through the native-plant and pre-Columbian sculpture garden. Linger on a bench in the shade or sun, surrounded by ancient stone gods and soothing ponds, and feel yourself magically transported back to a different time and place that is still connected to the modern world bustling just beyond the walls. After taking in the arts, why not do a little shopping? Southwest on Paseo de Héroes, across Av. Independencía, Plaza Río Tijuana is the largest shopping mall in Tijuana; an outdoor plaza where you can shop alongside the locals and the occasional foreign shopper. Stroll through Dorian’s department store, a half-dozen boutique jewelry vendors specializing in silver and diamonds and even a pet store. Or take a break from your day and see a movie at one of the two cineplexes playing movies generally in English with Spanish subtitles. But the real reason to shop at Plaza Rio Tijuana is for shoes. It’s known throughout the city as the place to find everything from inexpensive to top-of-the-line brands of sneakers, kid’s shoes, men’s dress shoes and high heels. Plaza Río Tijuana is also a great place to leave your car for the day. Drive the two long blocks past La Fogata, double back around the glorieta to the plaza and find a space. There’s additional parking behind the mall if you can’t find something near the street. They charge approximately US$0.50 for three hours. After shopping, you’ll need a snack and something to drink. Perhaps some refreshing sushi and a chilled martini? That’s the secret of Tijuana’s new culinary explosion: dining options aren’t limited to local cuisine. No place better embodies this spirit then Negai, a fusion sushi restaurant located only five minutes away. Owned and operated by two brothers, Negai looks and feels as if it were transplanted from South Beach. With 1970’s disco music pulsing on speakers, white floors and walls with pale banquettes, Negai blends traditional Japanese fair like tuna and hamachi with imaginative Mexican flavors such as tamarindo and serrano chili. One of their most unique dishes, an appetizer “Krispi Spice Rice” combines a warm, deep-fried rice “cookie” topped with chilled spicy tuna, a slice of avocado and a drop of Vietnamese “rooster sauce” to give it a lingering kick as the combination of flavors explodes in your mouth. They also offer excellent martinis in flavors ranging from chocolate, sandia (watermelon), pepino (cucumber) and tamarindo. Regardless of the time of day, you won’t be alone. Lunchtime is popular with young, hip Mexicans from the business sector while evenings give way to the beautiful and stylish youth and the burgeoning new art wave that is spreading across the city. If you’re not in the mood for Japanese, how about Italian, Brazilian or Argentine? They’re all part of “Restaurant Row” on the same block of Calle Escuadron 201. If you’re in the mood for meat, the place to go is Cheripan, the most popular Argentine Restaurant in Tijuana. Clean, sleek and spacious, in warm, dark wood tones, Cheripan bustles all night with families, large groups and couples off all ages out for a romantic evening. The meat here is to die for. Absolutely exquisite is the gauchesca arrachera, tender and covered with garlic, parsley, onions, tomatoes and a small amount of jalapeno so that the hotness isn’t overpowering. Also delicious is the steak in Madiera wine sauce with portobello mushrooms and the parillada for two — a traditional Argentine mix of chicken, beef and sausage served over at hot grill your table. If you are not a meat-eater, there are many vegetarian dishes, including handmade pastas. As expected, Cheripan serves a fine selection of excellent red wine (vino tinto) from Argentina; but for the adventurous epicurean they also carry an extensive list of domestic wines from all over Mexico. Ranging in price from US$25 to US$150, many of these reds will surprise and delight you. You’ll save yourself a lot of time at the border if you return to the United States that evening, but if you don’t feel like making the trip just yet, the Marriott Tijuana offers clean, comfortable beds in good-sized, well appointed rooms. With a modern, minimalist style and a friendly and attentive staff, the hotel has all the amenities of any major business/boutique hotel: wireless internet in the lobby and free internet access in every room, a business center, gym, heated swimming pool and two hot tubs. One of the best kept secrets in Tijuana, they are often busy but seldom filled to capacity. If you plan ahead, you can get the internet rate which usually runs about half-price. If you do, bring your swimsuit. You might just decide to stay an extra day. These are great tips for not only Tijuana, but Baja California Travel. Money: American dollars are excepted everywhere in Tijuana. There’s no need to convert money unless you plan on taking local busses. Credit cards are widely accepted. The conversion rate is around 10 Mexican pesos for 1 American dollar. Water: Tap water in Mexico is not potable. Most restaurants serve bottled water. Ask for agua mineral (mineral water) or agua natural (purified flat water) to be sure. Getting Around: Walking in Tijuana is safe by day. Like any city anywhere, be alert and watch where you’re going. The sidewalks are full of cracks and there is no standard height for the curbs, so keep an eye out. At night, driving or taxis are recommended. General nighttime traffic is light and the streets in the Zona Río are well-marked. Taxis are safe and reasonably priced. Rather than find a taxi on the street, ask the restaurant or hotel to call a cab for you. Car Insurance: Most American insurance policies do not cover your car once you leave the United States. Be sure to check your policy. Mexican Insurance can be purchased by the day from AAA, on-line or vendors a few miles north of the border off Interstate 5. Passport: Passports are mandatory for crossing the border in and out of Mexico. Make sure that you have yours with you, even if you’re just going for the day. Crossing the Border: With the proper documentation and insurance, traveling from the United States into Mexico is simple. Rarely is anyone ever stopped. Returning is a different story. Due to the enormous influx of people the delay can be as long as 4 hours. On weekends, if possible, try to leave Tijuana before 9 am or after 9 pm. Hotel: TripAdvisor is my favorite place to research hotels and find the best prices. You can find hotels in Tijuana for as little at $19 per night. Vino en Mexico? You Bet Your Grapes! The weather in Tijuana is the same as San Diego, which means any time is great to visit. More than weather, you want to plan your trip around the border and when lines will be shorter. High season is considered to be summer, all U.S. holidays and weekends year-round. If you enjoyed this article about the Top Things to Do in Tijuana, you’ll also love South of the border: The best cuisine and culture when you visit Tijuana. How to get there: There are two borders you can cross to arrive into Tijuana – San Ysidro and Otay Mesa. Otay Mesa is closer to the airport and San Ysidro is closer to the tourist areas. You can cross by foot or car. If you are flying, you can fly into San Diego International Airport, or Tijuana Airport. Find cheap flights Check Trip Advisor for the best flight to Tijuana. Where to stay: There are many places to stay in Tijuana. There is a wide range of hotels, from budget to luxury. For a luxury hotel that won’t break the bank, I recommend the K Tower Boutique Hotel By Lucerna which is currently the #1 hotel on Tripadvisor. For a mid-level hotel, I suggest the Tijuana Marriott Hotel. Finally, for a budget hotel, try the Hotel Real del Rio Tijuana. You can also check HotelsCombined for the best Tijuana Hotel Rates. Hotels in Tijuana: Check Trip Advisor reviews for K Tower Boutique Hotel By Lucerna or Tijuana Marriott Hotel. What to pack: Average temperatures in Tijuana vary somewhat. For women, shorts aren’t commonly worn in Mexico but are nice to have at the beach. I’d recommend bringing a skirt and a pair of athletic shorts (for outdoors activities or as a beach cover-up). A maxi skirt will do, since you can wear it in cool weather, you can also tie a knot in it to turn it into a midi or mini skirt in warm weather. For men, a couple of shorts and T-shirts should be enough. In addition to that, bring one pair of sneakers either trail runners for hikes or something like Toms for walking around cities. Get the Mexico for Tourist: See the Best Attractions, Save Money & Have Fun Top 10 Places to Visit. Bring a good quality mirrorless camera for getting those beautiful Tijuana, Mexico landscape shots. I use the Sony Alpha a6000 . A pair of strappy comfy sandals are great item to pack in a Mexico vacation you could wear it to nice restaurants, beach, and walking around town. Previous post A Peaceful Day in L.A.
Ed Horowitz is a screenwriter in Los Angeles. He has written independent and feature films and episodic television for Warner Brothers Studios, Universal Studios, USA Network and Lifetime. He is also a contributing writer to the Café Play Short Play Series at the Ruskin Theater in Santa Monica.